I was licensed in 1955 at the age of 15 and attended the famous Technical College, RCA Institutes in NYC. 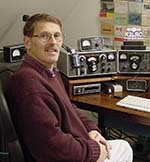 Also an active Life Member in the ARRL and a active member of the Collins Collectors Association since 1994. My Ham Station consists of numerous Boatanchors that I use on the Ham Bands with great joy. AM is one of my most enjoyable past times during the time that I have to be on the air. The Ham Station consists of a number of Collins S-lines, KWM-2A, and a nearly new complete KWM-1 station. In addition to a number of the A-line radios such as KWS-1/75A4/312A-1 Gold-dust twins. The AM station consists of the 32V3 and 75A1 combination with numerous microphones from both Collins and RCA. The newest AM addition, is a 30K-2. All of these Receivers and Transmitters have been reconditioned and continually maintained in my Collins Rebuilders Shop. The K2LRC Ham Station and Repair Facility is Relocating to the Sacramento/Lake Tahoe area. This provides me with a near perfect grounding system for antennas. The Repair Lab consists of HP RF gear including 8640B Signal Generator, 3586C Wave Analyzer, 141T Spectrum Analyser System, 5328A Frequency Counter, 410C RF Voltmeter, 400E AC voltmeter. Other gear consists of Tektronix O’scopes, Fluke Voltmeters, Bird Digital Wattmeters, Numerous Bird Analog Watt Meters along with a large selection of RF slugs. All gear is tested on a Variac AC supply to avoid any unexpected startup problems. We document the repairs made along with Test Data showing Output Power and Receiver Sensitivity. Having been in Amateur Radio for more than 40 Years along with extensive experience in repair and rebuilding ham gear we can provide you a source for the repair of your Collins gear. The stock of Collins repair parts often helps the repair of this gear, and we have the capability to find older parts from the market place.